From specialist mushroom producers to ensure success. Grown in mushroom compost for truly fresh reliable results. Growing your own Chestnut Mushrooms couldn't be simpler with this brand new fresh mushroom kit from the mushroom specialists! Traditionally mushrooms can be difficult to grow but these kits are guaranteed by a specialist small-batch mushroom farm. Once received and activated, you'll be start to see a tasty crop of fresh, healthy, organic mushrooms within just a couple of weeks. Containing premium brown chesnut mushrooms, they can be enjoyed both cooked or uncooked and are a versatile cooking ingredient, adding wonderful flavours and nutrition just as our chesnut mushrooms do. Perfect as a gift for even the complete grow-your-own novice, all you need is a quick daily spray of water. The instructions on the tub are simple to follow and will guarantee your success. Arriving as a complete kit, you don't need anything else to get going. Simply follow the instructions on the tub and grow. 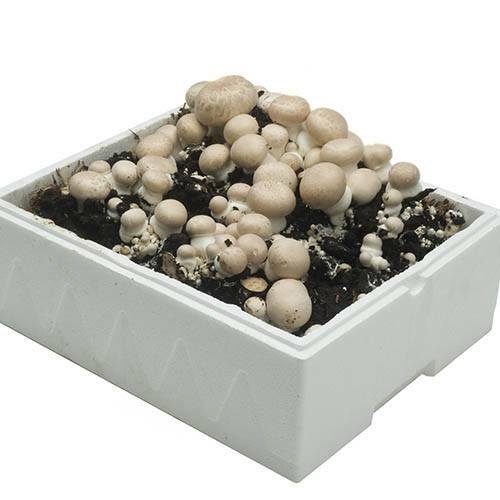 The cultivation of white or brown button mushrooms This set contains a layer of colonised com-post and a bag of cover soil. Take the bag with cover oil from the packag-ing and store it in a cool place. Set the packaging with the carton lid on top aside for + 4 days at a temperature of 20-25oC. (You no longer need to use the white lid) After this period, the compost will have turned completely white with fungus (myce-lium). Now take the bag with cover soil and punch ten holes in each side. Put the bag in 1 litre of water for 30 minutes, open the bag and spread the cover soil evenly and loosely over the compost. Now put the set aside with the lid closed for 5-8 days, at a temperature of 20-25oC. In this period, the mycelium will grow through the layer of cover soil to the surface. You can observe the growth when you remove the inner circle in the top of the lid. Once the cover soil has grown white with mycelium, you may indent the corners of the lid and place it back on the set. Also open the air holes in the short ends of the lid. Now put the set in a cooler place at 15-18oC. Make sure that the surface of the cover soil does not dry out by regularly mist-spraying with a plant spray. If a good number of pins appear, you may water the set with a watering can. The soil should be moist, but not too wet. The mu-shrooms first appear at the edges, and later in the centre. Harvesting: Take a mushroom between your fingertips and carefully pull it out with a twist of the hand. Do not pull out without twisting and do not harvest undersized mushrooms. Always water regularly to prevent the cover soil from drying out. If all mushrooms have been harvested, water again. After around a week, new mushrooms appear. This process may repeat itself three times. Good luck and bon appetit.